Elisha Golbe’s exquisite free kick on 33 minutes set the tone for a richly-deserved 2-0 victory for Nigeria Professional Football League (NPFL) champions, Plateau United over Rivers United on Wednesday. 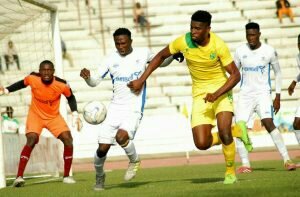 Burly striker, Emeka Umeh added the second, tapping in Tosin Omoyele’s defence splitting pass from close range as the Jos Lords won the match day two NPFL clash at a canter. The champions started on the front foot but stern defending and shocking displays of profligacy by the hosts’ forwards meant there was no scoring following a frenetic opening to the game decided at the New Jos Stadium. Elum Sochima almost gave Rivers United a shock lead against the run of play in the 26th minute but watched in frustration as his rasping drive flew just wide off Okiemute Odah’s right hand post. The hosts continued to carve out the better openings and boss possession but it was a premonition the guests from Port Harcourt failed to heed. They conceded a free kick just after the half hour mark, 20 odd yards from goal and Golbe licked his lips in anticipation stepping forward and planting a deft effort into the corner with a shell-shocked Robert Cole barely moving a muscle. Rivers United improved marginally after the break following the introduction of Ivoirian marksman, Guy Kuemian shortly after the restart but it was the home side that scored again with Umeh tapping home from close range following good work by the impressive Omoyele. The visitors attempted to hurl themselves back into the contest but Sochima, Kuemian and Ochowechi ‘Oche’ Salefu all failed to score from promising positions. Plateau United almost added a late third but Cole impressively turned away Kabiru Umar’s fierce drive from point blank range with the striker already wheeling away in celebration. Technical manager of Rivers United, Azunda Stanley Eguma and his counterpart from Plateau, Kennedy Boboye both spoke to our official website, http://www.riversunitedfc.com.ng (audio files have been attached) after the game. The win lifts Plateau United to second on the log with maximum points from their opening two matches while Rivers United slipped to 13th on the log after amassing three points from their opening two fixtures. Substitutes not used: John Gaadi, Ibrahim Akide, Ogene Elijah andKing Osanga. Substitutes not used: Sunday Rotimi, Malachi Ohawume, Ali Chiwendu and Daniel Israel.